Each June 6, Toronto Remembers the courage and honour of those who fought in the Allied forces’ invasion of Normandy, France on June 6, 1944. Please join members of Toronto City Council in honouring those who took part. An annual ceremony will take place on June 6 on Nathan Phillips Square, from noon to 1 p.m. In the early hours of June 6, 1944, allied troops departed the southern coast of England in total silence, under the cover of darkness. As dawn broke over the coast of Normandy, France, the immensity of the allied armada was revealed to the German occupying forces. The battle that ensued on that fateful day marked the beginning of the end of the Second World War. 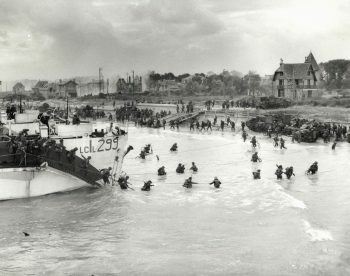 Approximately 14,000 Canadian soldiers fought on the beaches of Normandy — their mission, to invade and secure a stretch of the Normandy coastline code-named Juno. Toronto’s Queen’s Own Rifles received the worst battering of any Canadian unit on D-Day. 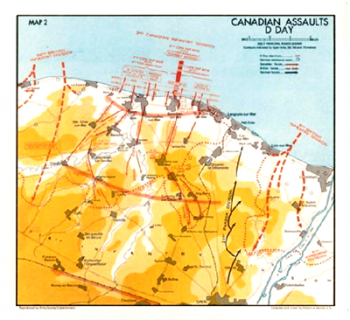 This is a map of where the Canadian troops landed and fought during D-Day.